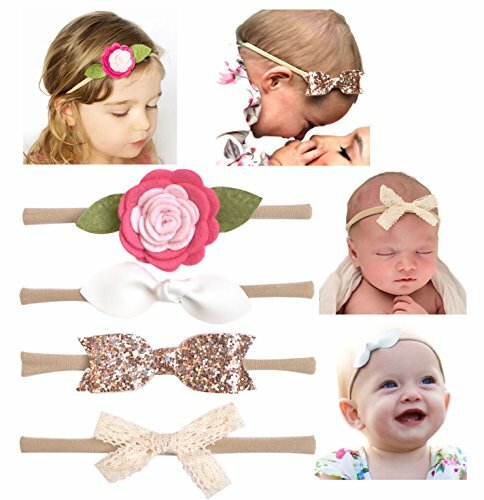 California Tot Soft & Stretchy Headbands for Baby, Toddler, Girls, Mixed Set of 4 (Shabby Chic) by California Tot at Resha Laser. MPN: 43221-4113. Hurry! Limited time offer. Offer valid only while supplies last. These nylon headbands are extremely comfortable, non-slip and very stretchy which makes it perfect for your little ones from newborns to bigger kids. These nylon headbands are extremely comfortable, non-slip and very stretchy which makes it perfect for your little ones from newborns to bigger kids. In fact, they even fit adult size (I tried!) This is a great gift idea or buy for your babies. They will be a good investment since they grow with the baby's head. All designs are done by a mom in Irvine, California. Thank you for supporting our small business! "Note that hair accessories could pose a suffocation risk or choking hazard. Babies and infants should not sleep with or be left unsupervised with the accessories." Includes 4 stretchy nylon headbands with bows: 1 Fuchsia Pink Felt Flower, 1 Bright white Faux Leather Rabbit Ear, 1 Rose Gold Glitter bow, and 1 Ivory Cotton Lace. So pretty! Felt Flower texture is fun to touch and brings the feeling of a fresh flowers to your little one's head. This set makes you feel Shabby chic with a touch of fancy lace, little shine from glitter, pretty felt flower and our classic rabbit ear bow, which will go with any outfit for your babies. Super soft and stretchy, non-slip. Extra gentle for your little one's head: Fits newborns, babies, toddlers, and little girls (up to 10 years). You can stretch it further by wrapping it around a cereal box overnight. Good for everyday wear, birthday parties, special occasions, baby photo props, and more! If you have any questions about this product by California Tot, contact us by completing and submitting the form below. If you are looking for a specif part number, please include it with your message.